“He is trying to make this putt to take the lead.” How many times have we heard that on TV? One of my favorite ways to help golfers make the transition from a poor mental game to a great one is to talk through all the things that are said and heard during golf telecasts. As avid players, most of us like to watch golf on TV, especially during the final round of a tournament. Be careful, though, of how listening to what they say might affect your attitude and mental game. On the compassionate side, my heart does go out to the commentators who are asked to fill TV time from Mon-Sun at many tour events. In the old days, golf was usually televised on Sat and Sun which only allowed Ken Venturi or Byron Nelson to talk for 4 – 6 hours of total time. Compare that to today where the Golf Channel acnhors must come up with new ways to be interesting and entertaining for several hours each day. The point of this post is that while many of the commentators were great players, they are now asked to describe the action in a way that they would never consider as competitors. No great player would ever think during a Friday round, “I can’t afford to miss this one.” On the contrary, they would simply follow their normal routine and execute the shot. 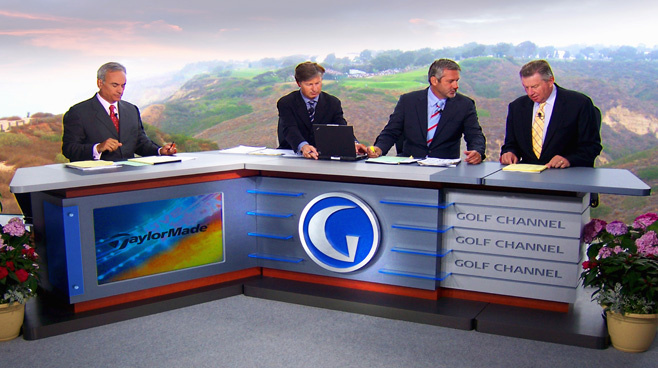 As you watch golf on TV, remember that it is still production meant to entertain and hold the attention of the viewer. That might include hearing people say bizarre and funny comments, but it is not how good players think or act during competition. Next time you are watching a Sunday final round, be sure to do some editing as you listen. Make sure any negative, critical or overly dramatic comments go in one ear and out the other and view it merely as entertainment. Allow the great play of the professional golfers to provide your real inspiration and enjoyment. Would you be interested in meeting and learning from a world-class coach? Just imagine having someone come alongside you who could help you improve and refine your skills and raise your performance? The fastest path to improvement is to use a coach. So to say the least, I was intrigued when a friend offered to introduce me to Mike Wilson. Mike is one of the top golf instructors in the world and keenly focused on helping good players become elite players. He had my full attention given he has coached some of the best players in the world including Master’s Champion, Mike Weir. Mike knows what world-class performance looks like and how to teach it. What brought us together was a mutual student. While Mike was coaching Jack the mechanics and process of a world-class golf swing, I was coaching Jack the art and science of elite goal setting and thinking. What we discovered was we were both using the same principle to coach very different things. We were applying the power of repeatable routine and process. When a routine evolves from the deliberate practice of process and technique it leads to skill and performance improvement. Every outcome or result we produce ultimately reflects a series of steps or actions—call it a routine. A golf score, a test result, or a quarterly income statement is an aggregation of actions. Have you ever thought about how a reliable and repeatable routine influences skill and performance improvement? Researchers have found that performance can be increased, even by highly experienced individuals, as a result of deliberate efforts to improve. In his book, The Checklist Manifesto: How to Get Things Right, Atul Gawande proves that the simple use of checklist (routine/process) has lead to the reduction of disease and infections, saved lives, improved safety, reduced plane crashes and the list goes on. The development of routine and process is a critical principle of performance. Great routine produces great outcomes. Routine and process is discovered through the process of deliberate practice using the expertise of a coach to guide, direct and correct. Mike Wilson recently asked me how often I thought golfers practiced with the sole objective of developing a repeatable performance oriented routine. If you are a golfer or have watched players on the practice tee, you know the answer is clearly no. Even with my knowledge and understanding of the power of routine I rarely if ever practiced a consistent routine. The truth is my playing routine and process on the course was completely random. So after our conversation, I headed to the range to conduct a test. I wanted to explore how routine and process affects performance improvement. For nearly an hour I methodically thought about my routine prior to and during the execution of a shot. It was hard to slow down and resist the urge to roll another ball over and just hit it. But after an hour, I had the makings of a routine. The next day I made a conscious decision to follow my routine on every shot. I wanted to further test the hypothesis that utilizing a defined and repeatable routine/process would produce a better result. While I am not an elite golfer, my benchmark for comparison was my stroke average over my prior 20 rounds of 76.55. At that moment, my attention shifted from my routine to my results. Hearing the possibility of shooting 29 captured my attention. I hit a terrible tee ball off the ninth tee. I completely failed to follow my routine/process and ultimately made a bogey five on a very easy par four hole. I regained my focus and birdied the 10th and 12th holes. Sticking to my routine I had three very near miss birdies on the 15th, 16th, and 17th holes. As we made our way to the 18th hole, I verbalized to my playing partner that this could have been a magical round. Those last three putts that hit the edge of the hole could have as easily gone in. And if they had I would be looking at a score of 61 or 62! As I stepped to the 18th tee, I was thinking about what might have been. I still could shoot 65 or 66, but I did not focus on my process. The tee shot was forgettable and lead to making a six and a final score of 68. Walking off he 18th green I was disappointed with my finishing hole. But, I was encouraged by what I had learned over the course of this test. Reviewing the round through the singular lens of routine/process, I concluded that I had three significant lapses in the execution of my routine. My failure to execute resulted in adding three to seven shots to my score. Mike Wilson is an expert coach. Even with all I knew about deliberate practice and performance principles I had excused myself from the discipline of executing my routine on every shot. Every outcome is the result of a process. Process/routine is a defined as a set of steps and actions that can be learned and applied to achieve a specific outcome or result. The fastest path to identifying and refining processes that will help you raise performance is to engage an expert coach.